This work aims to explore and problematize India’s discourses on its Diaspora policy vis-à-vis the reflections and experiences of actors on the ground. 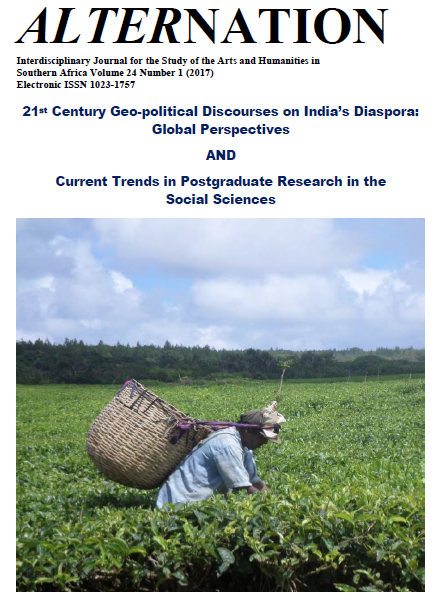 Historically, the Indian state has been known to project a founding and pioneering discourse on Diaspora closely connected and inter-twined with its foreign policy. Nonetheless, in its international outlook just as India continues to change and evolve over time, so do its Diaspora discourses and practices as per the needs of its foreign policy. From being distantly neutral and adopting diplomatic routes of concern for Indian origin people abroad during its early post-Independence outlook, India’s Diaspora policies have turned volte-face by shifting to the foreground of its global profiling in more recent times. Three important agents responsible for this role reversal are represented by the forces of globalisation, transnational geopolitics and Diasporization, acting in tandem with each other. Referring to these three as the, ‘International Triad’, (a term I employ as a heuristic tool), I undertake a qualitative analysis through review of literature, primary data including newspapers and ethnographic interviews conducted by me. It is clear that in its pro-active positioning and emerging Diaspora relations, India is no different from many other countries. Conversely, Indian Diasporas too have come a long way, emerging as not only key drivers in development efforts but also in strengthening bilateral ties between host and home nations as other diasporas do. No longer bereft of voice and rights, as much as in previous political contexts, the PIO and Diaspora communities stand on firmer ground while interacting with their home countries and ancestral homelands. However some vulnerabilities and status issues may still remain open despite the prismatic implications of the International Triad. The questions that therefore arise are: how do members of various Indian Diasporas assess the ‘everyday’ of this emerging relationship? Conversely, how responsive and compassionate is India to the qualitative expectations of its Diaspora?